Andrew Evans, M.D. 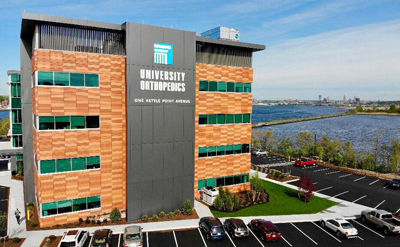 is a member of the Orthopedic Trauma Division of the Department of Orthopaedics at Rhode Island Hospital. He is an Assistant Professor at the Warren Alpert Medical School at Brown University. Dr. Evans specializes in the care patients with fractures and other musculoskeletal injuries of the upper extremity, lower extremity, and pelvis. Dr. Evans completed an orthopedic surgical residency at SUNY Upstate Medical University and a fellowship in Orthopaedic Traumatology at the University of Washington’s Harborview Medical Center. Dr. Evans research interests include the treatment of complex traumatic injuries to the extremities and pelvis, particularly open fractures, as well as the basic science of fracture healing. Dr. Evans has served on the Steering Committee for the Major Extremity Trauma Research Consortium for the past three years. He has received research grants from the Orthopedic Trauma Association and various private foundations to lead ground breaking research projects and has co-authored many peer-reviewed journal articles. He is a fellow of the American Academy of Orthopaedic Surgeons and the American College of Surgeons. He is a member of the Orthopaedic Trauma Association, and has lectured at numerous national meetings on a variety of topics. Appreciate that Dr. Evans made time for me on relatively short notice following a skiiing accident. He did a great job explaining my condition, putting me at ease, and recommending appropriate follow up care. I felt rushed. I am concerned by him saying I should be back to average action for a 77 year‐old. I want and expect to be back to where I was a month ago which is much better and active than the average 77 year‐old. I felt belittled. When I injured my leg and went to the emergency room, this was the MD;s name that was given to me to see. I was very pleased with the choice, he was kind, and professional, made me feel he was attentive to my needs and comfort. Woods BI, Rosario BL, Siska PA, Gruen GS, Tarkin IS, Evans AR. Determining the Efficacy of Screw and Washer Fixation As a Method For Securing Olecranon Osteotomies Utilized in the Surgical Management of Intra-articular Distal Humerus Fractures. Journal of Orthopaedic Trauma 2015; 29(1): 44-49. Lundy DW, Agel J, Marsh JL, Sietsema DL, Jones CB, Evans AR, Kellam JF. MFA Outcomes Scores Over Time for Tibial Plafond (OTA/AO 43) and Proximal Humeral (OTA/AO 11) Fractures: A Pilot Project. Journal of Orthopaedic Trauma 2015; 29(2): 60-64. Kadow TR, Siska PA, Evans AR, Sands SS, Tarkin IS. Staged Treatment of High Energy Midfoot Fracture Dislocations. Foot & Ankle International 2014; 35(12): 1287-1291. James IB, Farrell DJ, Evans AR, Siska PA, Tarkin IS. Open Reconstruction of Complex Proximal Metadiaphyseal Fragility Fractures of the Humerus. Geriatric Orthopaedic Surgical Rehabilitation 2014; 5(1): 9-13. Illical EM, Farrell DJ, Siska PA, Evans AR, Gruen GS, Tarkin IS. Comparison of Outcomes After Triceps Split Versus Sparing Surgery For Extra-Articular Distal Humerus Fractures. Injury 2014; 45(10): 1545-1548. Chen AF, Schreiber VM, Washington W, Rao N, Evans AR. What is the Rate of Methicillin-Resistant Staphylococcus Aureus and Gram-Negative Infections in Open Fractures? Clinical Orthopaedics and Related Research 2013; 471(10): 3135-40. Agel J, Evans AR, Marsh KL, Decoster TA, Lundy DW, Kellam JF, Jones CB, Desilva GL. The OTA Open Fractures Classification: A Study of Reliability and Agreement. Journal of Orthopaedic Trauma 2013; 27(7): 379-384. Evans AR, Routt ML Jr, Nork SE, Krieg JC. Oblique Distraction External Pelvic Fixation. Journal of Orthopaedic Trauma 2011; 26(5): 322-326. Evans AR, Pape HC. Percutaneous Fixation of Geriatric Acetabular Fractures. Operative Techniques in Orthopaedics 2011; 21: 265-271. Pape HC, Evans A, Kobbe P. Autologous Bone Graft: Properties and Techniques. Journal of Orthopaedic Trauma 2010; 24 Suppl 1: S36-40. Orthopaedic Trauma Association - Open Fracture Work Group. A New Classification Scheme for Open Fractures. Journal of Orthopaedic Trauma, 2010; 24(8): 457-465. Evans AR, Bottros J, Grant W, Chen BY, Damron TA,. Mirels’ Rating for Humerus Lesions is Both Reproducible and Valid. Clinical Orthopaedics and Related Research 2008; 466(6): 1279-1284. Evans A, Pinzur MS. Health-Related Quality of Life in Patients With Diabetes and Foot Ulcers. Foot & Ankle International 2005; 26(1): 32-37. Pinzur MS, Evans A. Health-Related Quality of Life in Patients With Charcot Foot. American Journal of Orthopedics 2003; 32(10): 492-96. Pinzur MS, Shields N, Trepman E, Dawson P, Evans A. Current Practice Patterns in the Treatment of Charcot Foot. Foot & Ankle International 2000; 21(11): 916-20. Determining the efficacy of screw and washer fixation as a method for securing an olecranon osteotomy.